It's been a month since I've had the chance to blog! I didn't mean to be quiet for so long, but Aaron and I have been so insanely busy that I haven't had time. Remember back in June, we decided to move to Indianapolis? We've been busy looking for a house for the past month. We're not just going to buy "any home" either. We're buying "the" house to raise our family and settle into our new city. Aaron is the king of thorough research so by the time we've been actually looking at the homes, he's already scoped out all of our desires and balanced against our budget. Once we were approved for financing, we went out with our realtor. Then last week, we visited my family and friends in the Bay Area for Thanksgiving and one last trip to CA before the baby is born! 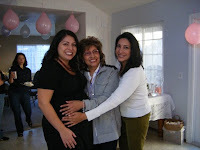 This picture with my mom and aunt is from my baby shower that my friends hosted while were were out visiting in CA. While the girls were visiting at the shower, Aaron went golfing with the guys. During our trip, we negotiated with a buyer and now we're under contract to close on our future home on Dec 22! We are so excited because it's a new home in an older neighborhood, not far from downtown. Life has been very hectic because evenings and weekends were devoted to house hunting and traveling. Getting 8-hours sleep is still a top priority to stay healthy, especially with my pregnancy. Sleep helps rejuvenate your body and balance your metabolism. I pack snacks when we're on the go. I cut up apples and put them in my purse in case I get hungry. Homemade trail mix is a easy when you stock your pantry. In a plastic bag, I throw in a handful of nuts (cashews, peanuts, or almonds), some dried fruit (dried cranberries, apricots, or raisins), and honey whole wheat pretzels from Trader Joe's. I put in a single serving and drop it in my bag and go! Stocking the basics: whole wheat bread, sliced low-sodium turkey or ham deli meat, eggs, milk, sliced cheese, fresh fruits and veggies. Instead of takeout when we get home really late from house hunting or traveling, I make all natural tomato soup (box from Trader Joe's) and a grilled cheese and ham sandwich. Or you can always cook eggs and toast for dinner! If you have carrots in the fridge, it's easy to peel and cut them for a quick snack for later in the day. A frozen meal works in a pinch. Trader Joe's has better-than-most frozen meals that I can pack for lunch for me or Aaron in the morning with fruit. There have been many nights lately that I didn't cook the night before and there's no time to make lunch before bed. I select the higher vegetable quantity, lower fat/sodium varieties like spinach lasagna for example. This Monday, I made dried pinto beans in the crockpot (see my recipe from dried black beans). I picked up pre-cooked chicken breast from yes, Trader Joe's, but you can get a rotisserie chicken from any grocery store. I made corn tortilla chicken tacos with tomato, avocado and lettuce (from my produce box) and served the beans on the side. It was a healthy and easy meal that produced a lot of leftovers. Don't skimp on vitamins. I take my prenatal vitamins and fish oil caps daily, but when I'm feeling extra tired or when I'm fight a bug, I use Emergen-C to boost my vitamin C and electrolytes. These are some strategies that have helped me, if you want to share your tips, please add a comment!